Geoff joined the financial services industry in 2012 after graduating from Grand Valley State University. Raised in Grand Rapids, he attended Forest Hills Northern High School. In addition to maintaining his CERTIFIED FINANCIAL PLANNER™ certification, Geoff is currently attending the University of Chicago Booth School of Business in their weekend MBA program. 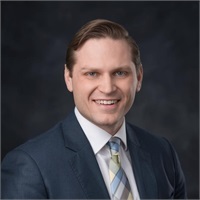 Geoff enjoys serving on several boards, including the Mayor’s Millennial Advisory Board, the Grand Valley Rowing Alumni Association, and the Grand Rapids Jaycees Foundation. Geoff has enjoyed coaching rowing at Grand Valley State University and Forest Hills Central High School, and feels his passion for coaching remains the heart of his financial practice. He currently resides in Grand Rapids with his wife Nichole and their growing family.